Talk about a mouthful! 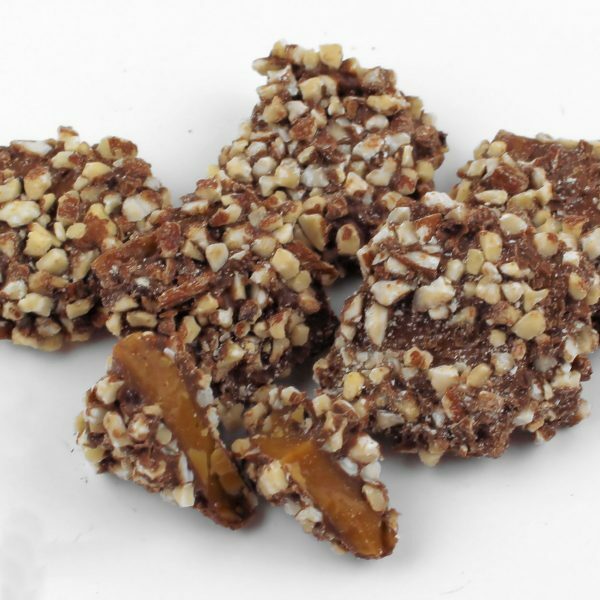 Rich, buttery, crunchy toffee covered in milk chocolate and rolled in fresh chopped California almonds. Milk Chocolate [Sugar, Milk, Cocoa Butter, Chocolate Liquor, Soy Lecithin (an emulsifier) and Vanillin (artificial flavor)], Sugar, Almonds, Butter (Pasteurized Cream, Salt and Natural Flavoring), Corn Syrup, Salt, Sodium Bicarbonate, Soy Lecithin and Tenox BCH. May contain Wheat, Milk, Peanuts, Tree Nuts, Soybeans and/or Eggs.